Food can be part of both the wonder and frustration of travelling. 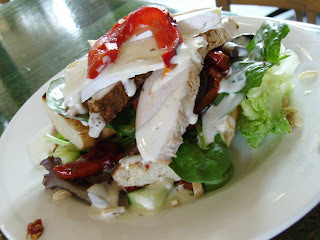 Finding new places to dine and new cuisines to sample is an exciting and often splendid experience. Sometimes, in unfamiliar territory, it can instead be hard to source a great encounter or, indeed, any dining options at all. Conversely, in a new town, the options are so numerous that the odds of hitting a bad one are worringly high. Happily, our Tasmanian experience was one where things turned out well more often than not. Bakeries were our breakfast destination of choice. I miss European bakeries, where, while a white breadroll could easily be a culinary event, they offer extensive sweet and savoury options. In Australia it's often all bread, muffins and pastry with cream in (perfectly acceptable in the right place, but not so often for breakfast). We'd been hoping for some woodfired pies in Exeter after our Tamar Valley wine run, but the way the day panned out saw us dodging logging trucks and chasing regeneration fires on the road to Pipers Brook before hunger struck. Luckily Pipers Brook vineyard (makers of excellent riesling and gewürztraminer) had a cafe on site. Theirs was a simple menu of six or so dishes, averaging about $15 and featuring local produce. Their own wines were generously available for $5 a glass. I selected an open baguette, with chicken, tomato pesto, mushroom, sundried toms, greens, King Island brie, topped with lemon aioli. Phew! A bit like something you'd put together if you needed to use up as many ingredients as possible, and happily something that worked very, very well. I wasn't sure what the tomato pesto would involve, but it was a little like a nutty chutney. The brie was wonderful, the French-style bread held its copious topping well and the aioli added a subtle and welcome tartness. The only downer was that all the wines I sampled afterwards tasted of sundried tomato! 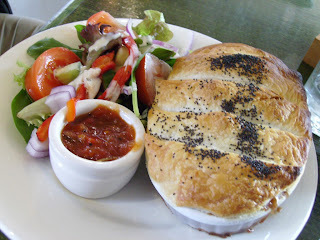 SG got his pie after all, going for the beef pot pie with sweet potato, and tomato relish on the side. It was a fine choice. The beef pieces were chunky and tender, balanced by the sweet pot, and the vibrant, fresh tomato relish added some great contrast. We picked up some astonishing strawberry jam to take home too. 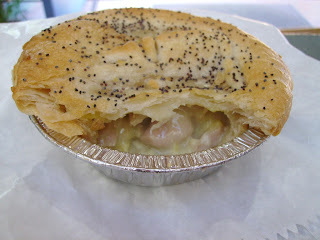 Pies also came to the rescue at Port Arthur. Stops at one too many gasp-worthy clifftop lookouts had us arriving at the deservedly famous site a couple of hours later, and much hungrier, than planned. We were booked on a tour 20 minutes after arrival, and grabbed a locally made pie each from the respectable Felons diner. Mine was chicken and camembert. Crisp pastry, gooey cheesiness and chunks of meat: a perfect belly-filler. Before heading to the Freycinet Peninsula we'd planned breakfast at Eureka Farm, south of Scamander, which does a range of fresh fruit, berries and preserves and make its own ice cream, which it serves at breakfast with pancakes. The chef was at the dentist though (!) so we made do with a jar of quince butter (extraordinary with Tas brie and crackers), a cone of strawberry ice cream and some apples. Retracing our steps to Scamander's Gourmet Food Shop, which is also the post and trading office, we were at first dismayed by their range, limited to pies and sausage rolls. 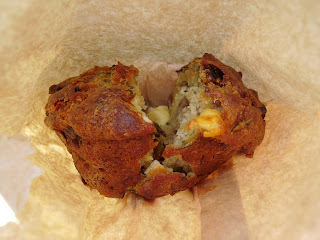 Happily they were also harbouring savoury muffins: sundried tom, capsicum, mushroom, fetta and parmesan to be exact. No, that's not their range, that's all in the one muffin! 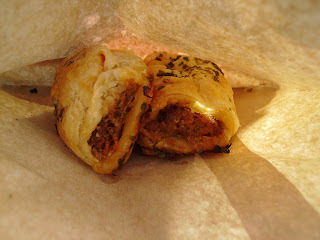 Warmed and with butter, it proved a fine start to the day, as did SG's two mini sausage rolls. 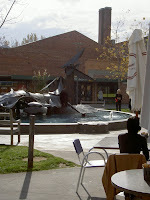 Our only cafe breakfast was in Hobart, at Say Cheese on Salamanca Square. A big sign advertising all manner of pancakes hooked us. They served about eight varieties, as well as standard bacon and eggs breakfast fare. 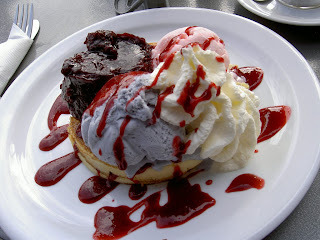 My Summerberry Pancakes came with seasonal fruit compote, blueberry ice cream, berry sauce and cream. Um, yes, that's quite a visual delight! Ice cream for breakfast is a wonderful notion, made entirely civilised by the fact I approached it with knife and fork, rather than spoon. The rivulets of melted cream running down the side of the pancake were enormously enticing. The 'fluffy' pancakes spruiked on each menu item were actually dense and doughy, but with all that fruit and ice cream going around I wasn't too bothered. I definitely like the idea that eating ice cream with a knife and fork makes it far more respectable for breakfast! Something to try at home perhaps - sans pancakes, just a bowl of ice cream, first thing, with chocolate topping, taken to with 'proper' cutlery!